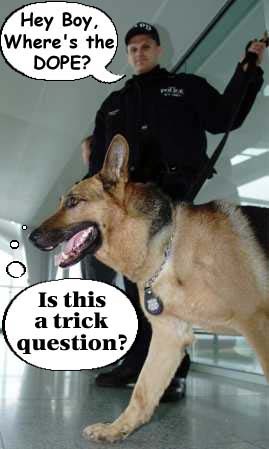 Are all sniffer dogs DOPEY? Following on from my recent experience with a sniffer dog who got it wrong, I thought I’d look into the success rates of these working dogs. From Australia…, this report card for Downunder’s sniffies includes a lot of Ds and must sniff harder. In Canada, they’re arguing over sniffer dogs and the infringement of civil liberties. Sniffer dogs should not be allowed to search for drugs in schools or public places – a recent ruling has decreed this to be the case – however, as the threat of explosives in airports is a more serious threat, sniffer dogs will still be allowed to operate there. I get it, but it is somewhat confusing. If an airport is a public place but I’m not an explosive, then why search me? It’s like those philosophical exercises: if a pig is pink and Maxine is pink then does that make Maxine a pig? It’s not exactly a yes or no answer. Besides which, in my experience, those bits of material that can be sniffed by a machine seem to be way more accurate than the dog (who’s probably more interested in food and people’s more delicate parts). Without boring you with the other articles I’ve found, I can summarise by saying that sniffer dogs are far less accurate than we assume, so the next time you see someone being hauled off for further questioning by a customs official and a Sniffy, you should NOT presume they’re transporting illegal drugs. It could just be that the dog hasn’t had dinner yet and wants some of that duty free chocolate in the nice person’s backpack. The song’s called ‘I wanna be a drug sniffing dog’ (in case you can’t quite make out the lyrics). It’s by LARD. When you think about it, dogs are more likely to be wrong in a “positive sniff”, so I’d say any search that happens because of what the dog is indicating isn’t reasonable cause. That article about the sniffer dogs in Australia was very interesting. Thank goodness for the Greens. I wonder how dog sniffing hold up as probable cause in court. Brandon – good question. Hopefully we’ll never find out the answer first hand! Until this experience I had pretty good faith in sniffer dogs. Now I think there are too many what ifs involved (what if the dog’s hungry, what if the dog’s training wasn’t effective, what if the dog’s bored, what if the dog’s tired, what if the dog just prefers a different smell to semtex?) . The most dangerous thing about making sniffer dog evidence admissible in court would be the fact that The Dog Can’t Talk.